In 1994, Christian von Koenigsegg decided to pursue his childhood dream of creating the fastest car in the world. Today, the Koenigsegg luxury sports-car brand is a world phenomenon, and fresh from breaking no less than five world records, the Skåne-based company is looking to expand with a major recruitment drive. Last year, the Nevada desert saw something extraordinary. In a single bright November morning, one car broke an astonishing five world-speed records, including the highest top speed for a production vehicle (447.19 kilometres per hour) and the fastest time in 0-400- 0 kilometres per hour (33.29 seconds). The feat was performed on a single set of tyres, on a closed-off section of a state highway, and completed in time for lunch. The car was the Agera RS, produced by Koenigsegg. 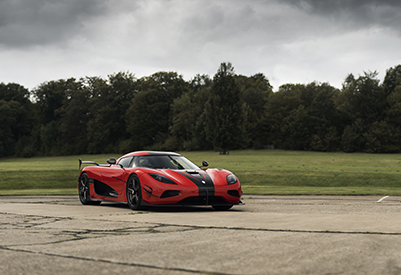 Based in Ängleholm in Skåne, southern Sweden, and currently with a team of less than 200, Koenigsegg is dwarfed by the size of its competitors in the field of ultra high-performance sports cars. Yet, an approach based on ground-breaking technical innovation and an obsessive striving after excellence have, against all odds, pushed the company to the very top of its field. In fact, the Nevada triumph was merely the latest in a series of records that Koenigsegg has left broken in its wake,and its cars’ high performance and iconic styling have been receiving international acclaim for years. While this is, of course, welcome, it brings its own challenges. Demand for Koenigsegg’s cars has never been higher, and with major markets established in North America, Europe, Asia, the Middle East and Australia, all production slots sold for the next three years, and a new model due to be unveiled at next year’s Geneva International Motor Show, Koenigsegg has now embarked on a major recruitment drive. “We’ve had incredible growth over the last few years, and that is going to continue, so we are looking for new team members right across our organisation,” von Koenigsegg explains, adding that the company is atypical in its practice of both designing and producing so many of its systems, components and technical innovations in-house. As a result, vacant positions include everything from CAD and software engineers to mechanics, saddlers, auto polishers, electricians and prototype technicians. Von Koenigsegg adds that the company is hoping to recruit as soon as possible and is looking for professionals who share an appetite for taking on challenges head-on. History-making is not the only accomplishment that marks Koenigsegg out as different. Every car is customised down to the last detail and Koenigsegg considers its customers to be active partners in the creation process. Welcome at any time to Koenigsegg’s facilities to watch their car being constructed – and to perhaps discuss some of the technical details with the technicians and mechanics while they work – customers, as much as employees, are seen as “part of the family”. You could quite literally say it was the stuff of dreams; after all, the Koenigsegg car company is the realisation of a childhood ambition, born when founder Christian von Koenigsegg saw an animated film about a race car inventor. 40 years after five-year-old Christian was entranced by The Pinchcliffe Grand Prix, and with the company on the brink of a major expansion, it feels very much like the adventure for Koenigsegg has only just begun.